Mind Body Therapy | Cancer Research Project - Ayurved Hospital and Research Center - Bharatiya Sanskriti Darshan Trust . :Ayurveda for Cancer:. Positive mind plays an important role in Cancer control. Cancer patients & their relatives are under tremendous stress, which should be relieved by proper counseling. 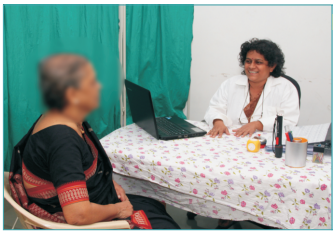 In our centre, Doctors, social workers and patients, whose Cancer is well controlled with the help of integrated treatment, are counseling other patients.